The winners of Pendle Business Awards 2018 were revealed at a glittering ceremony at the Fence Gate Inn – including Principal of Nelson and Colne College Amanda Melton who received the Chairman’s Lifetime Achievement Award. BBC North West Tonight’s Beccy Barr hosted the black-tie event organised jointly by Pendle Council and Pendle Vision Board. Shortlisted businesses were joined by the borough’s dignitaries, judges and sponsors at the Fence Gate Inn – Pendle’s finest 18th century inn and hotel. Dennis Mendoros, OBE DL, Chairman of Pendle Vision Board and President of Mendor Enterprises, said: “Last night was absolutely fantastic. It was our best event yet! “We were joined by some of the borough’s greatest businesses and I was really proud to be among them. “There was a lot of excitement as the winners of each award were revealed, which made for a fantastic atmosphere. The evening started with a champagne reception followed by a three course gala dinner and the much anticipated ceremony. Winners once again took away a coveted Pendle trophy – an elegant glass and metal sculpture inspired by Pendle Hill, made by local company Merc Aerospace. And all of the shortlisted companies received a Highly Commended certificate. The Awards, now in their sixth year, celebrate those businesses which have great ambition and are highly skilled in their sectors. Some are trading locally and globally and many have strong specialisms, including precision engineering and logistics. Dean Langton, Chief Executive of Pendle Council added: “Congratulations to all our winners and those who made the shortlist. The late Bill Oddie was recognised with a Chairman’s Lifetime Achievement Award. Presenting the Award, Dennis said: “Just days after celebrating 30 years at the helm of East Lancashire’s best-known bakeries, Mr Oddie, passed away at the age of 76. “He owned a baker’s dozen of outlets across the region, including Blackburn, Nelson and Accrington, and steered the 113-year-old firm through recession. Amanda Melton, Principal and Chief Executive of Nelson and Colne College, also received a Chairman’s Award for Lifetime Achievement. When announcing the Award, Dennis said: “Amanda’s role is pivotal in ensuring that we have the skills needed in Pendle to support the businesses based here. “As Chair of the Lancashire LEP Skills and Employment Board she identifies and addresses the skill needs of the county to support its growth plans. 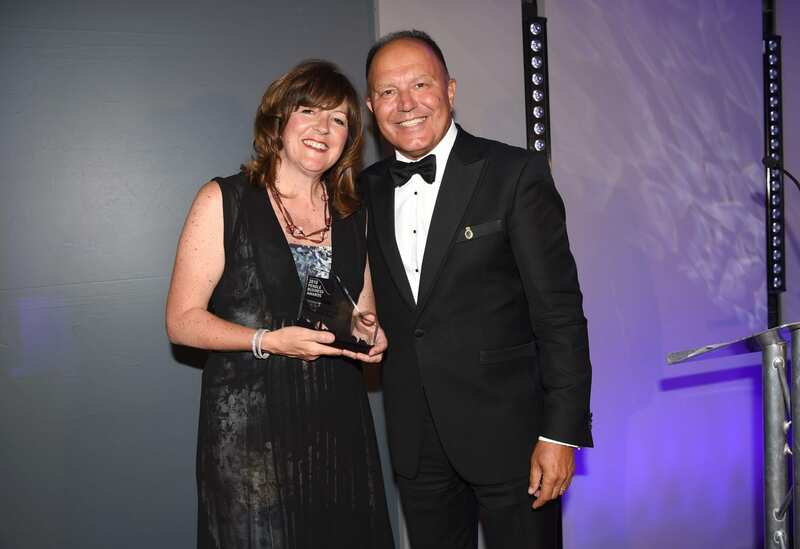 Amanda said: “I’m absolutely thrilled to be recognised with the Lifetime Achievement Award – this was completely unexpected and such a wonderful surprise on the night. “I am honoured and extremely proud to be considered for such an accolade at the Pendle Business Awards. Businesses helped to raise £2,000 on the night for this year’s nominated charity SSAFA The Armed Forces Charity which helps the Armed Forces, veterans and their families in Lancashire. A video of highlights from the night can be viewed here.